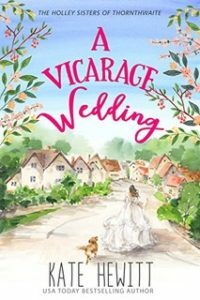 Welcome to my stop on the blog tour for A Vicarage Wedding by Kate Hewitt. 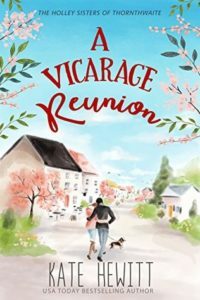 I have a lovely extract to share with you today along with a chance to win a copy of Kate’s previous book, A Vicarage Reunion. I’d like to thank Jenny Marston from Neverland Blog Tours for the place on the tour. Rachel Holley has always dreamed of a wedding—the white dress, the fairy tale, and of course, the happily-ever-after. But when her fiancé breaks it off the night before, claiming she doesn’t love him, Rachel’s fairy tale ends in ashes. She closed her eyes, breathing in the sweet smell of lavender and honeysuckle, before throwing off the silky duvet and rising from bed. Esther was already awake, showered and dressed, by the looks of the open suitcase and the towel hanging on the bathroom door’s rail. Rachel reached for one of the hotel’s complimentary dressing gowns, made of a thick white terrycloth as soft as velvet. She found Esther sitting outside on the private terrace, spreading jam on a croissant. “It’s past ten?” Rachel squinted in the bright, Technicolor sunshine; from their terrace, she could just glimpse the hotel’s pool, the placid aquamarine water shimmering with sunlight. “Did you sleep all right?” Rachel asked as she sat opposite Esther on a delicate wrought-iron chair. “Definitely.” Rachel busied herself making her coffee milky and sweet, her hair thankfully falling forward to hide her expression, which she couldn’t quite trust or judge. Yet as low as she felt, it was hard to stay down in the dumps when she was sitting on a lovely little terrace, sipping delicious coffee, in the south of France. Everything was perfect—from the rich, slightly bitter coffee, to the sweet strawberry jam on her flaky, golden croissant, to the honeysuckle-scented air and the sunlight pouring over everything like golden syrup. Despite herself, Rachel started to relax. She continued to relax as they went for their massages at the hotel’s luxury spa; it was impossible to tense up when a very competent Swedish masseuse was digging deep into her stressed and knotted muscles. Rachel came out feeling as if she’d been melted like butter. They spent an hour lounging by the pool, and Esther ordered sandwiches from the pool bar for lunch, before they headed upstairs to change for their walking tour. Thankfully, Esther had not felt the need to make much conversation, and Rachel was content simply to be and let herself be pampered by all the luxurious treats she’d planned several months ago, when she and Dan had decided on the south of France for their honeymoon. It was good of him, she acknowledged in a rare moment of empathy, to have forsaken his place on this trip, although perhaps he really hadn’t wanted to go. Perhaps he’d never wanted any of the things she had. She felt as if she had to question everything now, and it was an awful feeling, like dangling in mid-air, the solid ground she’d assumed had been right under her feet now miles below. She wondered how Esther had handled the conversation with Dan about the honeymoon, and then decided not to ask. She wasn’t ready for grim details yet. The old town of Aix was lovely, with a wide, pedestrian thoroughfare lined with elegant mansions with wrought-iron railings that dripped with brightly coloured bougainvillea, interspersed with upscale boutiques and outdoor cafés where tourists and locals alike lounged, sipping their lattes and reading newspapers or simply watching the world stroll by. By the time they got back to the hotel Rachel’s feet were aching and she was tired but a little bit happy—strangely so. Everything was so beautiful, and it felt good, after weeks of frantic stress, to relax. All she had to do was not think and she could enjoy all this week had to offer. Hopefully. But of course it couldn’t last. Over dinner that night, both wearing their nicest sundresses, sipping wine, Esther started at it again. Rachel wondered how long it would be before her sister couldn’t keep herself from asking another prying question. Five minutes? Ten? Amazingly, Esther controlled herself the whole meal, making sure only to talk about innocuous subjects—food, wine, France. She touched briefly on family—Anna and Simon, and when they might get engaged, before discreetly skimming away from that potentially fraught subject, although Rachel didn’t actually mind thinking about Anna and Simon and their undoubtedly forthcoming engagement; she wanted Anna to be happy. Someone should be, at any rate. Tonight, however, Rachel focused on enjoying the food and drink, as well as the lovely ambiance of the restaurant, all shadowy candlelight and murmuring customers. She kept up the mind-blanking enjoyment for the next few days, going from beauty treatment to leisure activity to decadent meal and back again, spending time in between lounging by the pool, supplied by Esther with a series of frothy blockbusters to read that did a very good job of keeping her thoughts otherwise engaged. And while Esther was as good as her word, keeping silent about Rachel’s marital woes—or lack of them, really—as the week wound to a close reality began its inevitable, relentless intrusion. 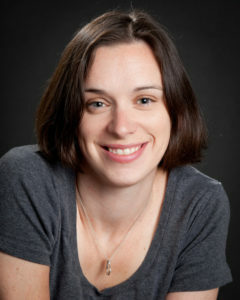 Kate is the USA Today-bsetselling author of many books of women’s fiction and romance. Her latest releases are A Mother’s Goodbye and A Vicarage Wedding. Under the name Katharine Swartz, she is the author of the Tales from Goswell books, a series of time-slip novels set in the village of Goswell. She likes to read women’s fiction, mystery and thrillers, and historical novels. She particularly enjoys reading about well-drawn characters and avoids high-concept plots.